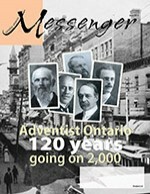 The Canadian Adventist Messenger is the official magazine of the Seventh-day Adventist Church in Canada. Our intended audience is members of the Seventh-day Adventist church, but we happily communicate with all who are interested. ENCOURAGE READERS, by nurturing all segments of the church community, sharing spiritual insights and practical applications, and building a network of people and resources. We will fulfill our vision by focusing on Canadian members, issues, and achievements; presenting candid discussions and multiple viewpoints; describing what works, what doesn’t and why; emphasizing the human interest element in stories; using visual elements to spark curiosity and hold attention; creating interactive channels for reader involvement; providing contact information for follow-up by readers.